"It is time that I governed myself." When considering historical dramas, there can be such a thing as too much attention to detail. As figures walked drearily from room to room in The Taking of Power by Louis XIV, I longed for any signs of life in the stoic material. The conversations are long and stilted, and the key moments are easily lost within the mundane scenes. The royal characters rarely move while the others talk, creating a nauseous feeling. At times, the actors (especially Jean-Marie Patte as Louis) seem to be trying to remember their lines while they speak, and they look in random directions while delivering the lengthy monologues. Not possessing great knowledge of the workings of the French leaders of the time, I struggled to focus even considering the brief 94-minute running time. This picture was directed by the Italian filmmaker Roberto Rossellini, who is well-known for focusing on realism throughout his career. His late career in the '60s and '70s included a series of historical biographies, with this one airing on television. Employing minimal sets and taking place mostly indoors, this story looks closely at the political and social aspects of Louis XIV's early reign. After the death of the chief minister Cardinal Mazarin (Silvagni) in 1661, Louis grabs the of power and must deal with pressure on multiple fronts. A particular nemesis is his mother, who criticizes his behavior and tries to manipulate the young king. Their scenes have a bit more life, but still lack much beyond a few minor arguments. It's a relief that we finally get outside at the 50-minute mark for the hunting scene, but even that is so ritualistic that it becomes painful. After the action, we quickly shift to a lengthy conversation shot in a dull long shot. It's almost too much to bear even if you're accustomed to slow-moving films. I would expect that Tony Scott and Michael Bay have nightmares of having to work on this type of film. There are few cuts and memorable moments, and it takes a focused brain to catch the shady maneuvers by nobles like Mr. Fouquet. With his long black hair and goofy mustache, Pierre Barat plays Fouquet with a bit of energy, but he's acting in a different movie. During the first hour, I kept expecting the buildup to lead to some type of dramatic punch, but the final act includes the same dreary moments. It is a surprise to see D'Artagnan, but he is wrapped into the same claustrophobic atmosphere. I applaud Rossellini's attempts to avoid melodramatic traps and depict realistic scenes, but it works better when matched with an interesting story. Another issue is Patte's performance, which never conveys the intelligence or regal bearing needed to make Louis memorable. He seems consistently uncomfortable in the costumes while speaking a large portion of the dialogue. His severe look only works if we've seen another side, and it never appears to balance the depiction. Patte had never acted on screen before, which helps to explain his vapid work. He does make a minor comeback in the sad final scene, the best of the film, but it doesn't compensate for 90 minutes of dour acting. I would expect that The Taking of Power by Louis XIV would perfectly serve the needs of history teachers trying to show the inner workings of the French court. They could pull certain scenes to use as visual aids for the discussions. Considered as a complete film, however, this movie offers a frustrating, sleep-inducing experience that is a hard sell to most audiences. Even viewers with serious patience will probably get bored watching this endless parade of dull sequences. I'm not a Rossellini expert and am unable to compare this picture to his career as a whole. But I can't imagine this can be one of his better creations. It's a brave attempt to present history in a different light, but it feels more like directorial vanity than anything worth spotlighting for modern audiences. Image Transfer Review: The Taking of Power by Louis XIV appears in its original 1.33:1 full-frame transfer, which delivers a muted experience. The colors lack sharpness and the brightness is minimal, and it matches what you'd expect to see in a late-'60s TV movie. The transfer has minimal grant and specks, however, which leads to an adequate presentation. Audio Transfer Review: This release uses a basic mono transfer that offers minimal power and depth. This relates more to the original source material than to anything done by Criterion. The quiet sounds match the slow-moving beats of the entire movie, making for a sleepy experience. Extras Review: In standard Criterion fashion, this package includes a small booklet offering an intelligent essay giving background on this film. Colin MacCabe, Professor of English and Film at the University of Pittsburgh, makes the case for the importance of The Taking of Power by Louis XIV. I don't agree with much of his take but appreciate the added perspective on Rossellini's career. The disc includes Taking Power�a visual essay from film scholar Tag Gallagher. He comments accurately on Patte's stiffness and off-screen line readings, which were used by Rossellini to depict the character. Gallagher treats it like a positive aspect, but I think that's a stretch. This 25-minute piece spotlights some effective moments and pays attention to the director's career as a whole. This release also contains interviews Rossellini's son Renzo and several members of the crew. In a recent segment, Renzo describes his father's attraction the TV medium. The brief conversation does provide some extra information on this picture from the second-unit director. The other discussion (from Mk2 in 2004) includes Artistic Advisor Jean-Dominique de La Rochefoucauld and Script Supervisor Michelle Podroznik. Speaking separately, they describe the film's creation and give more interesting details on the production and Rossellini. The Criterion Collection deserves major credit for continuing to spotlight movies that have slipped through the cracks. 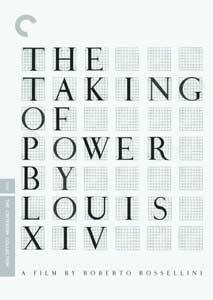 However, I would urge caution if you're planning to check out The Taking of Power by Louis XIV. European History buffs and Rossellini completists might find value, but others will probably lose interest in this slow-moving picture.